On the occasion of the Mid-Autumn Festival, in order to express the Group's care for the employees, we thank all the staff for their hard work. On the afternoon of September 21, China Transport issued Mid-Autumn Festival benefits to all employees. The group leaders personally selected the company. 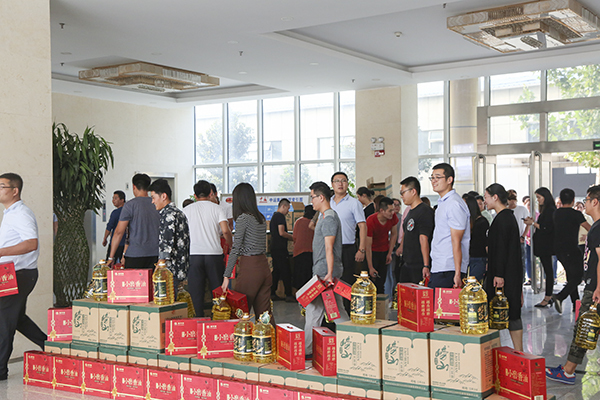 A box of welfare items was sent to the hands of every employee, and also sent to the group leaders for the deep care of the staff and the Mid-Autumn Festival blessings. Over the years, China Transport has attached great importance to the humanistic care of its employees in corporate management. Every traditional festival such as Mid-Autumn Festival, New Year's Day and Spring Festival will provide employees with intimate and affordable welfare items, reflecting the people-oriented corporate culture of our group. Enhancing the cohesiveness of the company also enhances the sense of ownership of employees as the home of the company, so that employees feel the warmth of the company's family and add momentum to the development of the company. The atmosphere of welfare distribution was lively and enthusiastic. Everyone cooperated with each other and each of them was responsible. The joy was full of words and expressions. The group was filled with a warm and harmonious festive atmosphere. The heavy welfare brought laughter to everyone, and it also brought a lot of emotion to the employees. Everyone said that they will turn the care given by the group into a driving force, taking China Coal as their home, loving China Coal, building China Coal, and loyal to China Coal, contributing to the development of the Group!